Like any machine, your Hypertherm cutting system requires proper care and maintenance to operate at peak efficiency. Hypertherm Preventive Maintenance is a comprehensive package that ensures maximum productivity, while minimizing the operating costs of your cutting system. Hypertherm Preventive Maintenance reduces the likelihood of emergency repairs and unplanned downtime. It's an ongoing, proactive approach that not only extends the life of consumables, but also extends the life of your entire cutting machine. The Hypertherm Cutting Institute (HCI) offers a rich curriculum of convenient, free online learning opportunities, including videos to help optimize your Hypertherm products. Watch some examples below. 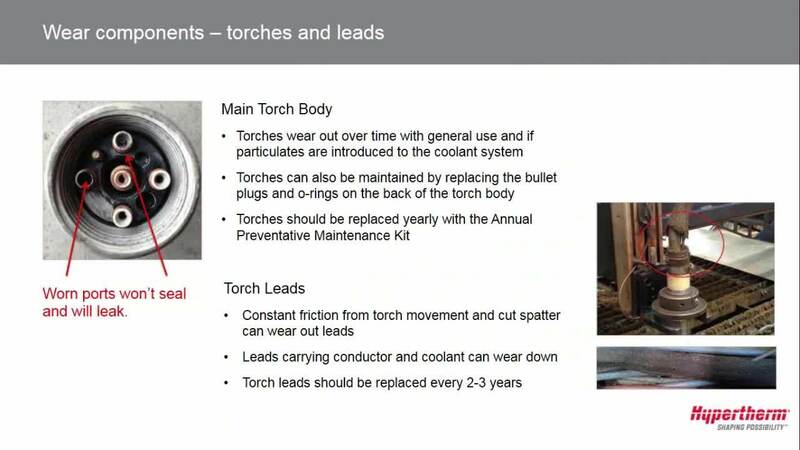 Rebuild your HPR® and HPRXD® torches to extend life and maximize performance. Learn how to change the coolant and coolant filters on 130, 260, and 400 amp HPR® and HPRXD® autogas systems. We've talked about system care in the past. It's like your car. To get the best performance, you need to regularly maintain it. The Owner's Manual included with every new Hypertherm system, CNC, and THC outlines exactly what to do. You need to have a good operator and you need to keep your plasma system and table (if you're using a table-based system) in good shape. Learn how regular preventive maintenance can keep your plasma system in top shape.